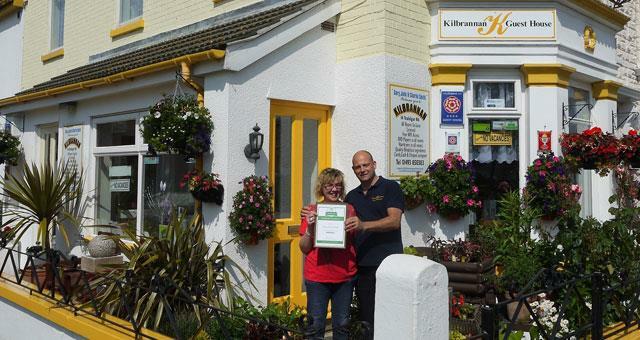 Kilbrannan01493 850383work01493 850383fax Guest HouseKilbrannan Guest House is situated within very easy walking distance from Great Yarmouth seafront and town centre alike, which makes most attractions and shops accessible by foot in minutes. Holders of two 'Traveller's Choice' awards and a 'Visit England' Rose award for service excellence, our outstanding customer service is also reflected in our 'World Host' recognition. We have 3 double rooms which can be available for single occupancy, and 2 family rooms which can also be available as double or twin rooms. All rooms are fully en-suite and 'room 1' has a large private bathroom attached encorparating separate shower and roll top bath. The many facilities in each room include DVD players, hairdryers, Flat Screen TVs, good sized fridge, fresh daily towels, assorted toiletries and much much more. Free WIFI access is also available and parking is free. Our award winning breakfasts are prepared and cooked freshly by our resident chef using the best quality, locally sourced and home made ingredients so you are guaranteed to start each day with a feeling of fulfillment. Whether you want the full works or something lighter we have it all and all diets are catered for. The grid shows the prices and daily availability from Tue 23 Apr 19 to Mon 29 Apr 19. It's easy to check availability for particular dates; just use the calendar to choose the check in date, select the number of nights and click the 'Search' button. Click the Book button to book the highlighted days. 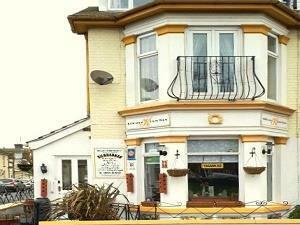 With Book the room booking will be confirmed immediately, with Book the room reservation will be confirmed within 24 hours..
Kilbrannan Guest House is situated within very easy walking distance from Great Yarmouth seafront and town centre alike, which makes most attractions and shops accessible by foot in minutes. Children welcome from age 4. Haven’t stayed for couple of years. It was lovely to return and find Kilbrannan continues to satisfy in all departments. Thank you for a brief but very pleasant stay, Julie and Gary. The region is easily accessible by road from all parts of the UK. Major trunk roads into Norfolk are M11, A11, A12 and the A14 from London and the South-east, while the A47 and A14 serve the Midlands and the North. On approaching Great Yarmouth follow the signs for SEA FRONT. With Britannia Pier on your left follow Sea front until you reach Pirates Golf, turn right into Trafalgar Road. There is a regular local service from Norwich to Great Yarmouth. With connecting trains from Norwich to London, Liverpool Street. Peterborough, Cambridge & Ely.